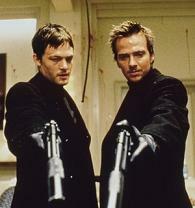 Summary: B:tVS, Boondock Saints. Buffy has never had a boyfriend whose hands were free of blood. Notes: The title is Latin for "The Truth Shall Make You Free". All series entries are titled in Latin, also. Series was a Runner Up in Round 29 of the Sunnydale Memorial Fanfiction Awards.